Angelina Mejia (formerly Contreras), also known as Angel, has been involved with music since the age of 9, when she started the flute in 4th grade. 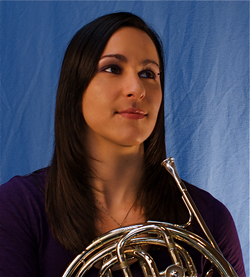 In the 7th grade, she switched to French horn and never looked back. During grade school, Angel was involved with the band programs, including concert band, marching band, and drum line. At Vallejo High School, she was the Drum Major of the band her senior year and she decided to attend Sacramento State University for her under-graduate studies. Angelina graduated from Sacramento State in the summer of 2007 with her Bachelor of Music (BM) in French horn performance, and her BM in Music Education. During her studies at Sacramento State, Angelina began teaching Elementary School Band in the San Juan Unified School District. In 2002, Angelina took over the band program at Woodside Elementary School in Citrus Heights. She has also taught the band programs at Orangevale Open K-8 School in Fair Oaks, Citrus Heights Elementary, and an after school program at Sam Brannan Middle School in the Sac City School District. Currently, Angelina teaches at Cowan Fundamental School in Sacramento. She has a beginning band that is open to all 4th, 5th, and 6th graders; returning students move on to intermediate or advanced bands. In addition to teaching beginning band, Angelina also teaches French horn lessons to any level player (beginning to advanced), as well as lessons for beginning brass instruments. She began teaching lessons in 2002, and maintains a studio of at least 8 to 10 horn students in the Sacramento area. Many of her students have been accepted into local honor bands (Cap-Section and All-Northern) and All-State Honor band. Several of her students are also members of the Sacramento Youth Symphony. Angelina is also an avid free-lance performer in the area. Locally, she performs with the Placer Pops Chorale and Orchestra in Rocklin and Folsom. She has also performed with the Sacramento Philharmonic and the Sacramento Choral Society. Outside of the area, Angel is the principal horn of Opera Modesto and second horn of the North State Symphony in Chico/Redding. She has also performed with the Santa Rosa Symphony, Oakland Symphony, the Apollo Symphony in Oregon House, and the Sierra Master Chorale in Grass Valley. During college, Angelina was a member of the San Francisco Youth Symphony Orchestra, and was the horn player in the Liberace Scholarship Woodwind Quintet at Sacramento State.